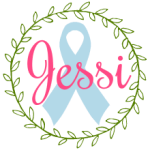 This year for PCOS Awareness Month, I wanted to do an Etsy Shop Showcase to show some places that you can get some pretty fantastic pieces of PCOS Awareness jewelry! Last year, I posted a picture on Instagram of me wearing my favorite PCOS awareness necklace. Several people asked me where I had purchased it, but unfortunately, the shop I purchased this necklace from in 2009 has since closed. Thankfully a quick search on Etsy revealed that there are several shops selling PCOS awareness jewelry, and each one has something unique and special to share. I reached out to 3 different shops and asked permission to showcase them this month, so today I’m going to share with you some of their pieces and where you can purchase them. FertileGems has some beautiful, dainty pieces – many of which represent all aspects of infertility or pregnancy loss. Part of what I loved about her shop is that she includes 5 free pregnancy or ovulation tests with orders of her fertility gems. How cool is that?! I thought that offer was so thoughtful. In addition, she includes an inspirational quote print-out with many of her orders, which I thought was also incredibly sweet. She will have a special one for the month of September on orders of PCOS Awareness jewelry. On several of the products, you can pick which gems you want included – I love a good piece of custom jewelry. Besides being beautiful and high quality, I think any of the FertileGems pieces would inspire you to feel positive about your infertility journey, and of course, feel beautiful! My favorite piece is this one. Even though the shop isn’t just about PCOS, RoughRockJewelry recognizes the importance of PCOS Awareness, so she is giving you 20% off during the month of September with the code pcos20. 🙂 My favorite piece is this one. I can tell her pieces are all designed to really empower women to take control of their PCOS and not let it define them negatively. My favorite piece is this one. For the month of September, SoulCysterCreations has a very special limited edition necklace for sale, and $5 from each sale is going towards PCOS Challenge. If you want this necklace, you have to order during the month of September. The shop owner is also offering an extra 10% off discount for my blog readers, so be sure to use the code LIFEABUNDANT when you place your order. But again, you only have this month to do it! What all 3 of these shops are doing is really important to me. Not only are they are spreading PCOS Awareness in a variety of ways, but they are also spreading awareness of other forms of infertility and pregnancy loss. Jewelry often turns into conversation pieces – what a simple, beautiful way to start a conversation, whether with friends and family, or complete strangers. I often get asked about my necklace, and it presents a wonderful opportunity to share my heart. In honor of PCOS Awareness Month, treat yourself to one of these pieces of PCOS awareness jewelry! I’m definitely going to… although it’s going to be really hard deciding which one! Disclaimer: all images were used with written permission. Please do not use these images without obtaining the same written permission from each shop owner. I love this!!!! Such beautiful pieces for such a good cause! This was fun to pull together! All three shops were so nice!